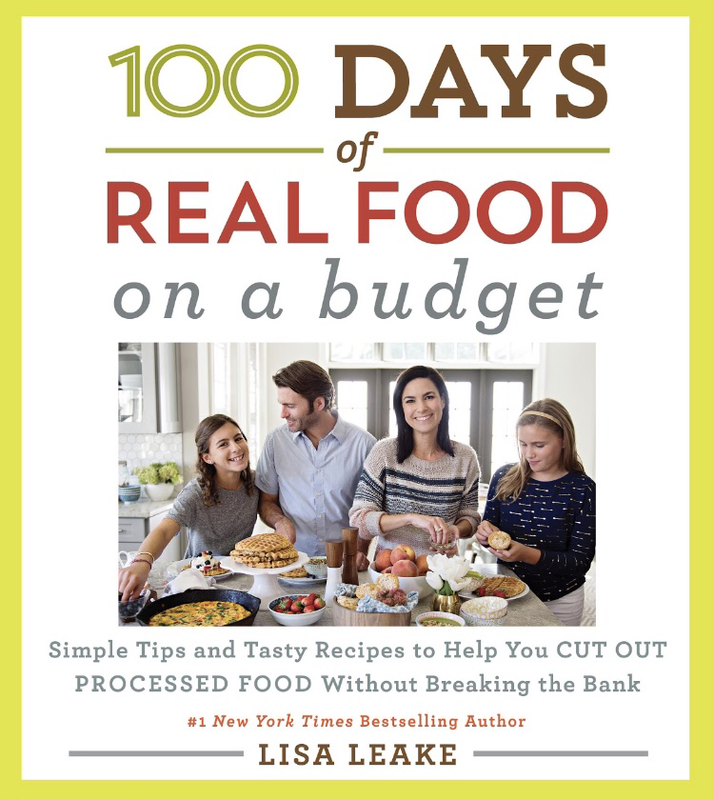 While the holiday season can be a fun time filled with friends and family, there is also an abundance of food that is typically out of your normal routine. My family has some delicious foods we make every year to celebrate Christmas, such as Monkey Bread, Twice Baked Potatoes, Snowball Cookies, and the annual Christmas Eve Italian dinner we have at our family friends’ house. It is so much fun to share these dishes with the people we love, and while it is important to enjoy these foods, it is equally as important to have a diet that incorporates what makes you feel your best. Around the holidays, there is a sense of guilt around enjoying traditional Christmas foods. Instead of just focusing on those around you and indulging in some of your family’s once-in-a-while treats, many people feel the need to impulsively overeat in one day, with the intention of being “good” the next day. Instead of listening to how they are feeling, they choose to ignore this internal cue, resulting in an overbearing feeling of sickness and unhappiness. If people instead focused on enjoying themselves during the holiday season and eating both healthy foods combined with some of the festive treats, they would feel better about themselves and have a healthier attitude towards food. Worrying about food never helps your health, and certainly doesn’t contribute to a positive relationship with yourself or with food. If you’re anything like me, then after the holidays you might tend to crave hearty recipes filled with veggies. 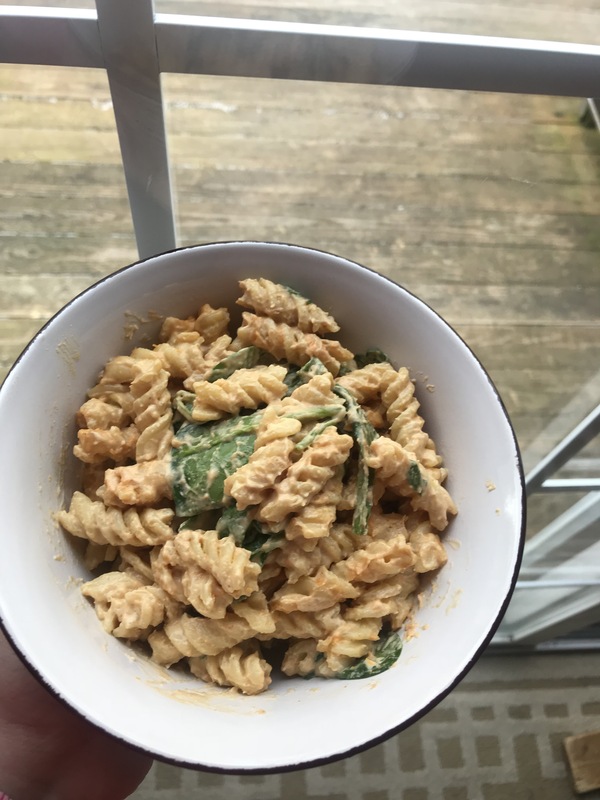 I typically am a little more sensitive to dairy, meaning that I avoid having excess amounts of it, so after all of the cheese and cracker appetizers of the holidays, I love making recipes such as this dairy-free pasta to refuel. This pasta uses cashews as the base of the cream sauce to create a rich flavor packed with protein. It also adds in some extra veggies for both taste and nutrition, which you can customize based on your own preferences. This dish is perfect to whip up as an easy dinner or to share with others! So, enjoy the rest of the holiday season, and eat what makes you feel good! To start, add all ingredients for cream sauce to blender and blend until smooth and thick. In a medium skillet, mix pasta with veggies and cream sauce and heat until warm. Serve or keep refrigerated for up to 3 days. 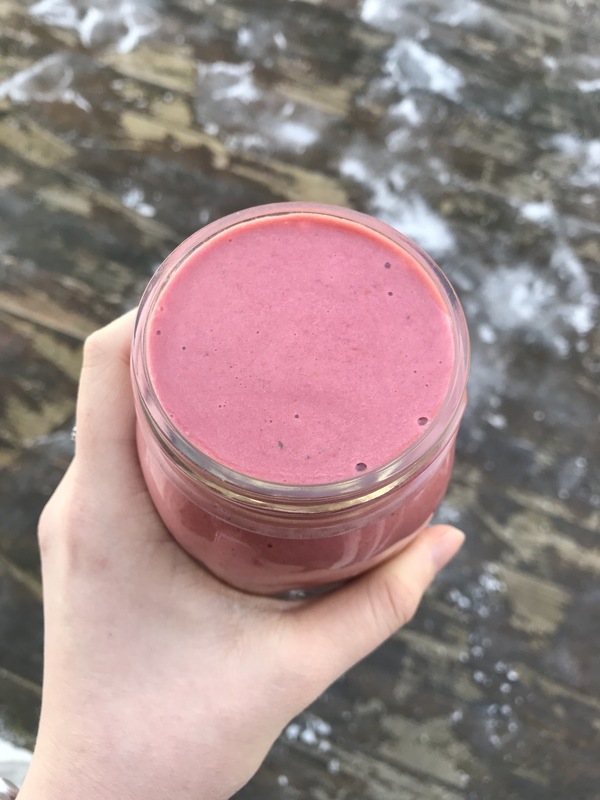 As winter approaches, it is a great time to test new recipes and experiment with adding your favorite ingredients to create your own healthy, unique dish. Lately, I have been on a cauliflower kick, and have loved using cauliflower in place of traditional starches I would use in recipes such as pizza, pasta, and rice. Not only is cauliflower almost identical in taste, but it also packs an extra nutrient punch into all sorts of recipes. 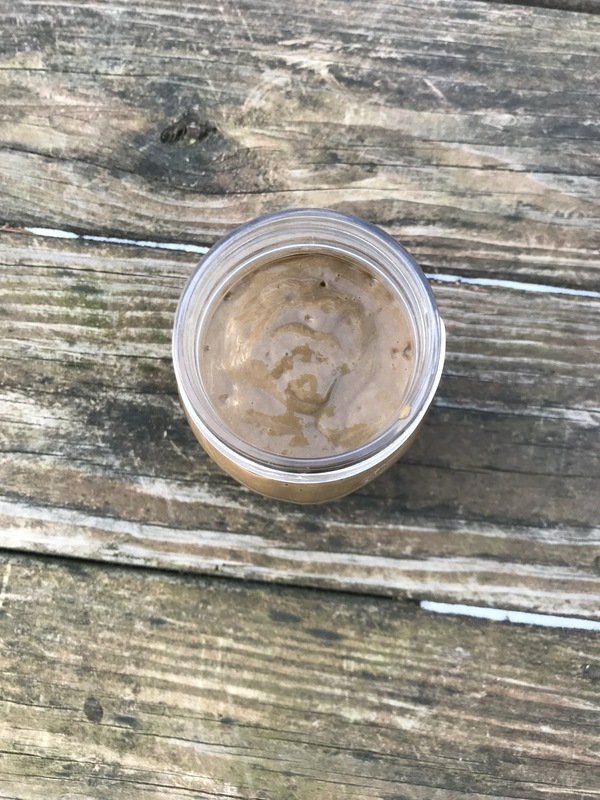 It’s versatility makes it easy to cook with, and you can easily switch things up by adding new sauces, veggies, and/or proteins. 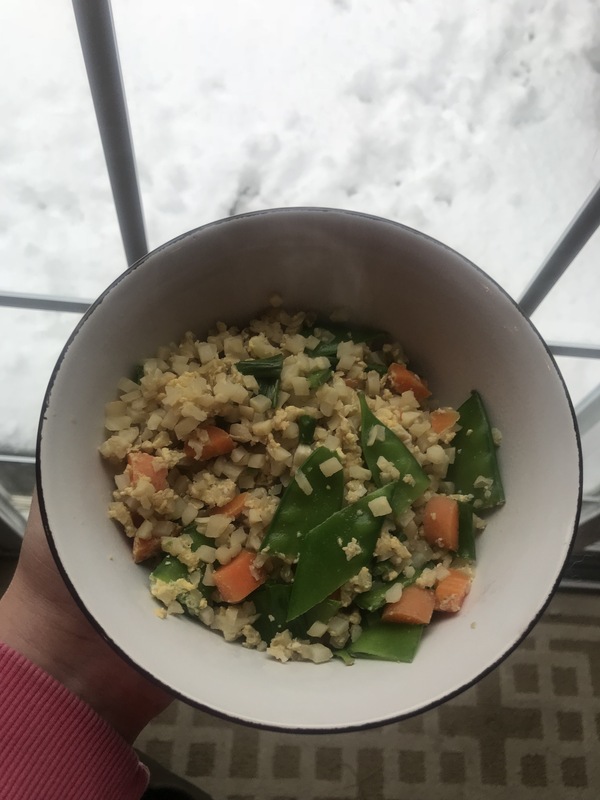 The other day when we were off of school, I wanted to make some kind of stir fry, but realized we were out of the typical ingredients I would use. So, I decided to make a homemade fried rice with similar flavors, and ended up coming up with this recipe. This cauliflower fried rice tastes just like traditional fried rice, and can easily be customized with your favorite add-ins. So, please enjoy, and let me know what you think! In a medium skillet over medium high heat, add cauliflower rice and water. Once defrosted, add butter, soy sauce, and garlic powder. Add in chopped sugar snap peas, carrots, and onions, and crack both eggs into skillet. Continue to mix until evenly distributed throughout rice, and serve with green onion on top, Enjoy! Chances are, if you’re even slightly involved in the health food world, then you’ve heard about (or tried) the increasingly famous cauliflower gnocchi. This pasta-like phenomenon is definitely as good as the reviews say, and I have easily jumped onto this bandwagon. One of the main reasons why this dish is so popular, in my opinion, it’s it’s versatility. You can cook up this gnocchi with some pesto, tomato, mozzarella, and drizzle of balsamic vinegar for a caprese version, mix it with some tomato sauce and basil for a true italian taste, or make it my favorite way, which I’m showing you here. After trying to find the absolute best version of this gnocchi that brings out all the best flavors, I found that this recipe I came up with was always ranked first. 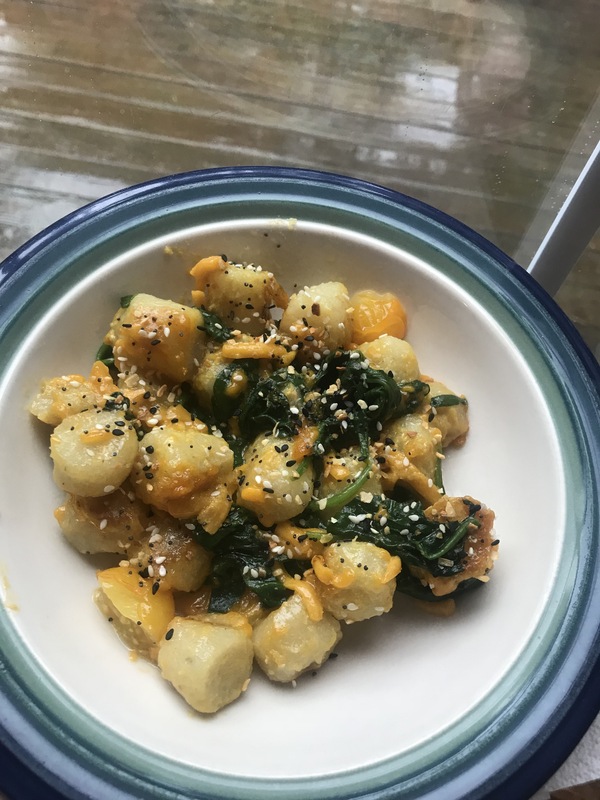 While many might like this cauliflower gnocchi (I find it at Trader Joe’s) because it is gluten free and a lighter alternative to the traditional potato and ricotta gnocchi, I like the taste and simplicity it. This is the perfect side to whip up in a flash, or you can easily add in a variety of vegetables, chicken, or your favorite add-ins for a warm and filling meal. They key to my recipe is actually not cooking the gnocchi like the package tells you! The first time I made this and was experimenting with a recipe, I cooked the gnocchi according to the directions and found myself with a soup-like, squishy consistency. If you try it this way, however, you’ll find yourself with gnocchi that has a golden crisp on the outside and a soft, doughy pasta inside. In a medium skillet pan, add gnocchi, water, and olive oil. On medium high heat, cook the gnocchi until defrosted and slightly golden, about 8 minutes. Add in nutritional yeast, spinach, and tomatoes, and cook on a medium low heat for another 5 minutes, until slightly crispy and spinach and tomatoes are cooked. Sprinkle in cheddar cheese and mix until melted. After plating, sprinkle with Everything but the Bagel seasoning, if you’d like. Enjoy! It’s officially that time of year… pumpkin everything season! Every year around September, brands of all types began selling their version of a pumpkin spice product, some good and some definitely not. While I definitely have my favorites (pumpkin pie Perfect Bars YUM), it’s important to watch out for what’s actually pumpkin spice and what’s hiding behind a name. Not only has Starbucks hopped on the train of pumpkin spice flavoring, but so has everything from crackers to almond milk to goat cheese. However, many of these brands use artificial pumpkin flavoring, and have no actual trace of real pumpkin in them. I don’t know about you, but I’d much rather have real pumpkin, not only because it tastes better but also because it’s better for you! 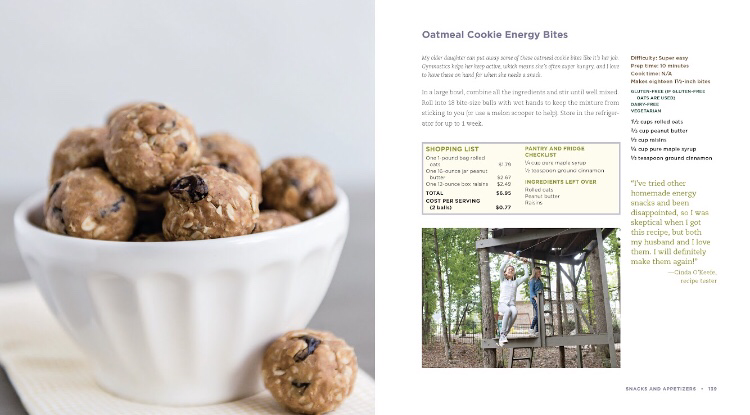 Fall is the perfect time to make simple and delicious snacks and treats to share with others, and these energy bites are the perfect choice. They are a great addition to your morning yogurt bowl or with some fruit on the side for breakfast, or you can grab a couple in between activities for a quick pick-me-up. Yum! 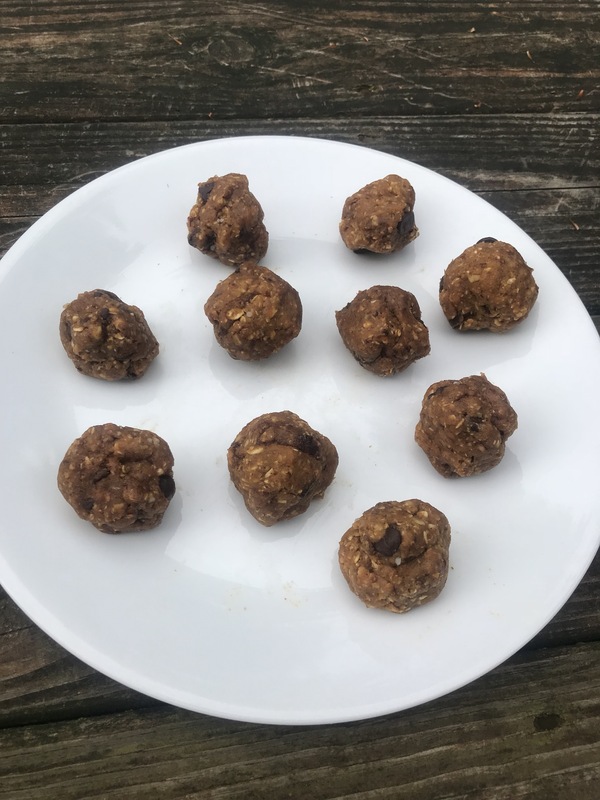 These can also be made with or without chocolate chips, and the addition of collagen peptides make these bites a great source of protein and boost for your hair and skin. In a food processor, combine all ingredients and chop until smooth. Roll into bites or other desired shape and refrigerate for up to one week. Enjoy!